As the No To Bike Parking Tax protestors started their daily ride this morning towards Trafalgar Square to cause enormous traffic jams on the Central London roads, they noticed an unusually high police presence on their favourite roundabout, as if someone had made plans the day before to stop the bikers exercising their legal right to protest as UK citizens and residents. Once they realised that their “make us pay to park like cars and we’ll behave like cars” protest was not going to happen in the usual manner, they decided to go for plan B. They all quickly left Trafalgar Square for Victoria Street to kindly welcome all the Westminster City Council staff and councillors, as they came to work, and wish them all a fabulous day ahead. 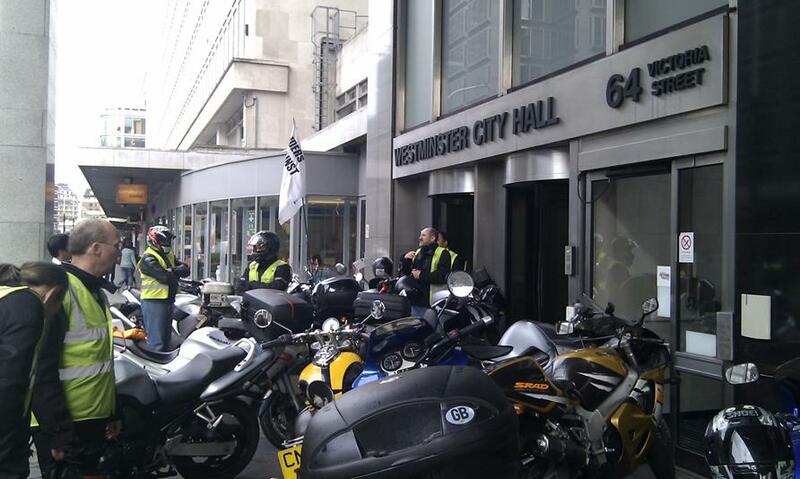 As it is no longer free to park motorcycles in the streets of Westminster because kerb space in that borough comes at a higher premium than everywhere else, the bikers had no alternative but park just outside the entrance doors to the council’s building, where parking is free of charge, thus blocking access and forcing all staff to stand outside in the rain. 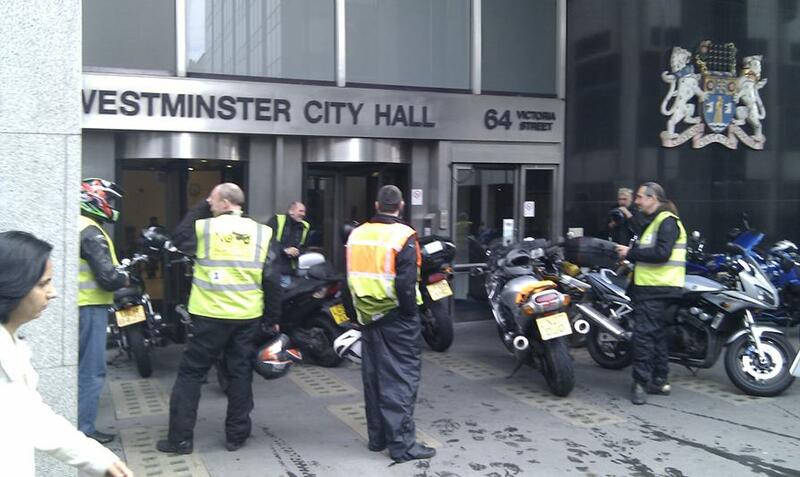 We were amused to hear about Westminster Council staff forced to stand in the rain, when it is the same staff who take an inmense pleasure to force the bikers to stand in the rain while paying the parking tax by mobile phone before safely leaving their bike. Protestors parked their motorcycles very close to each other and in front of all entrance doors, so that no one could even squeeze in and try to enter the building in a desparate attempt to impress the boss. Bikers were very amused to see the reaction of some staff, who were simply speech less as if they had never seen a protest right under their nose before. It was quite funny to see them running around like headless chickens, trying to find a back door somewhere that could have been left out by the bikers. But unfortunately, there wasn’t any that the bikers had forgotten to obstruct, so Westminster Council staff and councillors had the pleasure to stand in the street without knowing what to do for a good hour. After all, it’s only fair that they got a taste of what their victims have to do every day, precisely because of Westminster City Council still refusing to scrap the much hated motorcycle parking tax. While disruption was caused directly to Westminster City Council this morning, Transport for London (TfL) enjoyed a morning off in that they didn’t have to deal with the daily enormous traffic jams in Central London caused by angry bikers riding their motorcycles as if they were driving cars. The Conservative Mayor of London, Boris Johnson, was not given the opportunity this morning to threaten the bikers again with shuting access to bus lanes if they carried on exercising their legal right to protest. The bikers came back this evening during rush hour to their usual location (Trafalgar Square roundabout) to cause complete gridlock again. Thousands of commuters were once again stuck in traffic and had to face enormous delays in their journey back home this evening. 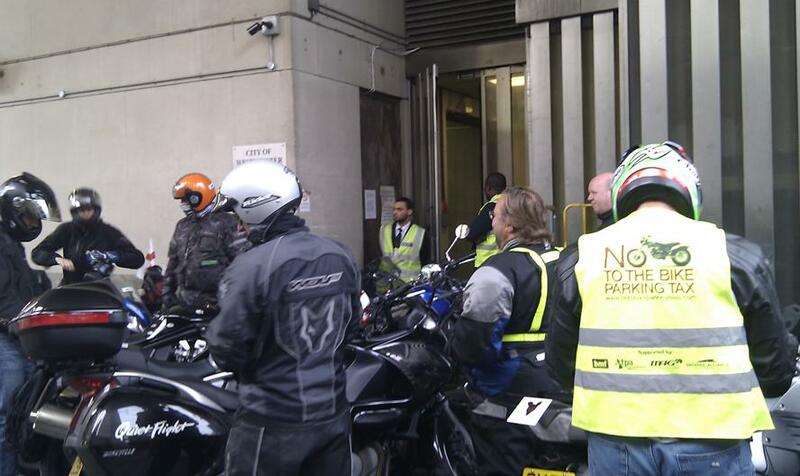 The bikers will be back every morning again to cause more and more chaos on the London roads during rush hour. We have heard that these No To Bike Parking Tax protests are now having an enormous effect on the authorities, particularly TfL and Westminster Council. All they have to do is scrap the bike parking tax for all this massive disruption to cease, although they could have done that two years ago to avoid so much trouble and embarrassment now. 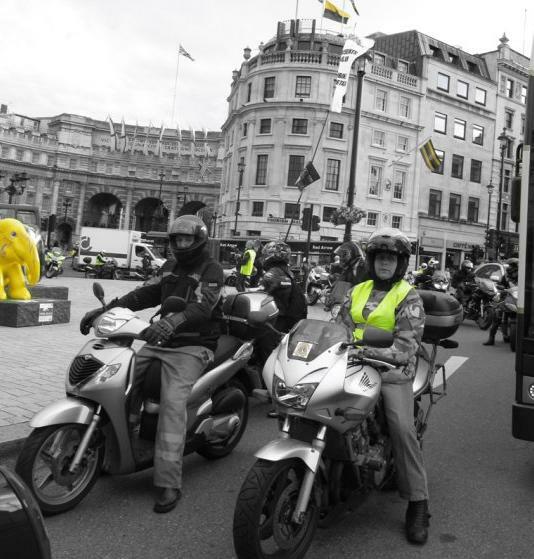 Westminster Council thought that the bikers would go away after a couple of months of protesting but the truth is that two years later, they’re still there in higher numbers causing massive disruption to the daily schedule of thousands of Londoners. The bikers will not go away until this disgusting parking tax is scrapped. The United Kingdom is slowly changing. UK citizens are now starting to be tired of being manipulated by the authorities and are starting to stand up for their own rights. The bikers are showing the example, who is next to protest? The Conservatives have asked UK citizens to vote for change, so let’s make sure that change is being implemented, starting with the full scrapping of Westminster’s motorcycle parking tax. POWER TO THE PEOPLE! LET THOSE WHO RIDE DECIDE! The protests are growing in numbers and popularity. The only way out of these inconveniences is the scrapping of this anti bike charge. You for to mention that it was the RATS who blocked the Back! the only embarrassment is for the bikers who are acting like big babies. boohoo. Engage in reasonable debate and we will return the favour… trade petty insults and receive them in turn..
Well we all know how annoying whining babies can be. Best thing to do is SCRAP THE TAX and let us all go back to our playrooms. Until then we are not going away. There’s no need to throw your toys out the pram Niles – it was only a protest. It didn’t inconvenience the public, just those who work for greedy Westminster Council. You wouldn’t happen to be one of them, would you? I can’t think why else this demo would have bothered you. “niles adams” Moi, je pense que vous ne pas voir plus loin que le bout du nez. Pourquoi un mec comme moi, acheter un téléphone mobile, obtiennent et une carte de crédit et créez un compte afin de garer mon motard ? Maintenant je dois payer un livre mais je suis sûre que, après deux ans la redevance de stationnement va augmenter. Aussi cette disposition sera à l’échelle nationale. Avant de rouler où vous devez ouvrir un compte dans la ville que vous comptiez visiter. Comment vous sentez-vous à ce sujet ? “niles adams” I think you’re seriously lacking in foresight. Why should a guy like me have to buy a mobile phone, get a credit card & open an account with WCC just to park my bike ? Now I would have to pay £1 but I’m sure that in two years the charge will increase. Also other local authorities would iniate this. Before riding anywhere you’d have to open an account in the town you going to. What do you think of this ?